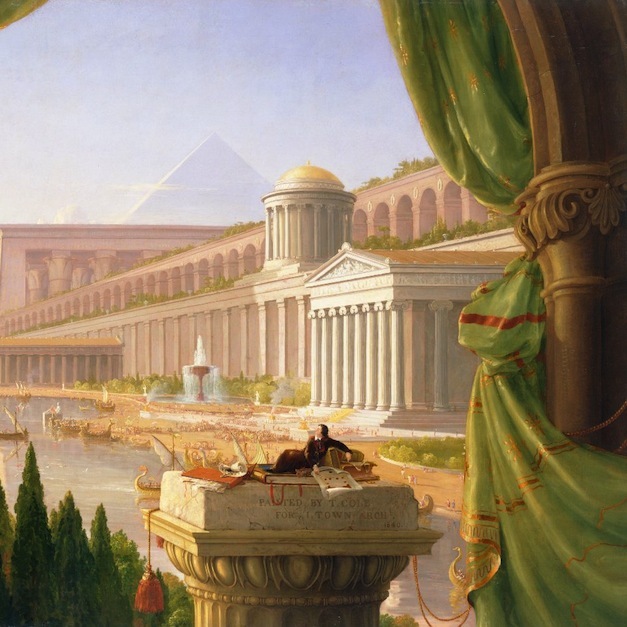 Thomas Cole: The Artist as Architect is the first exhibition to focus on the little-known fact that the renowned leader of the Hudson River School of American landscape painting designed three buildings and had plans for others before his untimely death. The exhibition includes paintings that reveal Cole’s architectural proclivity, drawings that document his recurrent focus on architectural structures, and elevations and floor plans for his built and visionary projects. The Hudson River School, which Thomas Cole helped founded, dominated American visual arts between 1825 and about 1870 and helped to stimulate interest in environmental preservation, ultimately laying the groundwork for the establishment of the national park system. Cole’s Hudson River School continues to influence contemporary artists. However, few people realize that Cole designed buildings. One of Cole’s notable architectural achievements is his design for the Ohio State Capitol, drawings of which are included in the exhibition. Also included in the exhibition are Cole’s landscape paintings, some showing ancient ruins inspired by his European travels, others with 19th-century grand houses. Central to the show is Cole’s visionary painting The Architect’s Dream (1840), on loan from the Toledo Museum of Art and Cole’s The Cascatelli, Tivoli, Looking Towards Rome (circa 1832) from CMA’s permanent collection. The exhibition is organized by the Thomas Cole National Historic Site, in association with Columbus Museum of Art.